Rev. Kang Mun Song (center in the picture), Head Master of Dongrea Won Buddhist Temple in Busan, and his family including Rev. 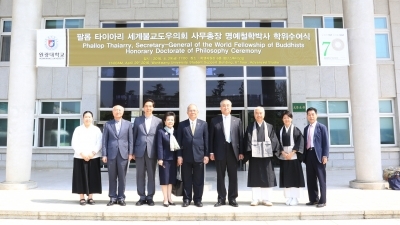 Sunmi Choi (far left in the picture) from Won-Buddhism, which is a Regional Center of the WFB in the Republic of Korea, had paid a visit to the WFB Headquarters on 10 October B.E. 2559 (2016) after having paid their respects to King Bhumibol Adulyadej at the Grand Palace. They were welcomed by Rear Admiral Isara Yimpanich, Hon. Assistant Secretary-General of the WFB. Rev. Kang Mun Song also made his personal donation to the WFB Headquarters. Mr. Phallop Thaiarry (Secretary-General), Rev. 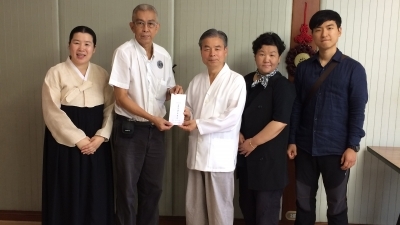 Yoshiharu Tomatsu and some of EXCO Members of The WFB had visited Wonkwang University which is an affiliated academy of Won-Buddhism, Republic of Korea on 29 May B.E.2559 (2016). On this occasion Wonkwang University had bestowed an Honorary Doctorate in Philosophy to Secretary-General of The WFB. Earthquake of magnitude 6.5 and 7.3 tremor hit Kumamoto Prefecture in Japan on 14 and 16 April respectively which followed by series of quakes within 48 hours. Total 41 people were killed and more than 1,000 people were injured. Almost 92,000 residents have been evacuated from their homes, with around 100 properties completely destroyed and a further 800 damaged. 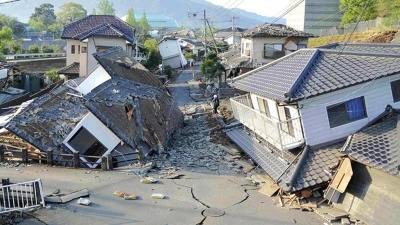 After the quake, there were continuous series of aftershocks that triggered a number of landslides as well as the collapse and cracking of major roadways in the mountainous region. Meanwhile, The WFB Headquarters is considering to provide assistance in this regards. H.E. Phan Wannamethee, President of the WFB, led a group of Ven. Shakyavongvisudhi Sakya (Assistant Abbot of Wat Bavorn Niwes Vihara), Mr. Phallop Thaiarry, and other representatives to Nepal to observe progress of Nepal Humanitarian Relief Project and the development of Lumbini Project. 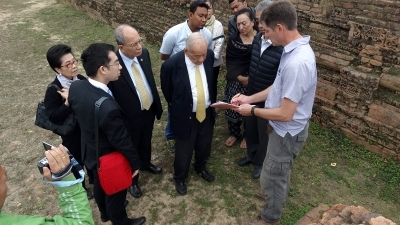 On this trip the group also paid respect to Mayadevi Vihara (the birth place of the Lord Buddha) and King Asoka Pillar Thai Temple in Lumbini including participated in the Makhabucha Ceremony at Thai Temple in Lumbini. H.E. Phan Wannamethee, President of the WFB, assigned Mr. Phallop Thaiarry, Secretary-General, participated in the V Congress of World and Traditional Religious on “Dialogue of Religious Leaders and Politicians for Peace and Development” in Astana, Republic of Kazakhstan. The conference is held consecutively since B.E. 2546 (2003) under the initiative of H.E. 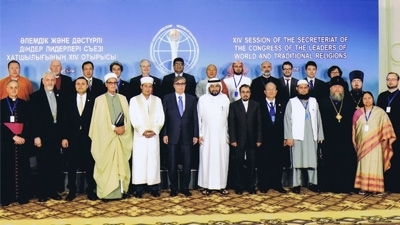 Nursulran Nazarbayev, President of Republic of Kazakhstan with the objective of promoting the dialogue of mutual understanding and cooperation among religious leaders, politicians, and heads of international organizations. Rev. Yoshiharu Tomatsu, Executive Council Members of The W.F.B. 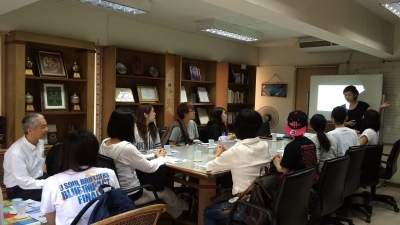 led the lecturers and students from Department of Human Life and Environment Studies, Faculty of Human Studies, Taisho University in Tokyo, Japan to a study tour at Sikkha Asia Foundation in Keha Klongtoey, Bangkok. They are welcomed by Ms. Arunee Promma (Secretary General) and Ms. Akiko Motozawa (volunteer) who showed them activities of the foundation. Her Excellency Saida Muna Tasneem, the Ambassador of People’s Republic of Bangladesh to Thailand, had invited The World Fellowship of Buddhists, Headquarters to a commemorative event on “Celebration of Bangladesh-Thailand Shree Buddha Maitri: A Tribute to the 88th Birthday of His Majesty the King Bhumibol Adulyadej” held on 9 December B.E. 2558 (2015) at Buddhamonthon Auditorium, Nakorn Pathom, Thailand. There were a seminar on “Bangladesh-Thai Shree Bouddha Maitri: Enhancing Cultural Connectivity” in the morning and followed by Ceremonial Prayer Chanting dedicated to H.M. King Bhumibol Adulyadej in the afternoon. His Majesty King Bhumibol Adulyadej graciously commanded that the Royal Funeral of the late His Holiness Somdet Phra Nyanasamvara, Supreme Patriarch of Kingdom of Thailand who passed away on 24 October B.E. 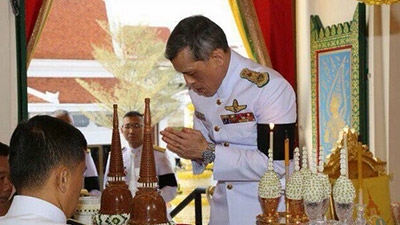 2556 (2013); to be held at the Phra Meru Royal Crematorium of Wat Debsirindravas on 16 December B.E. 2558 (2015). Tentative Program is attached herewith. 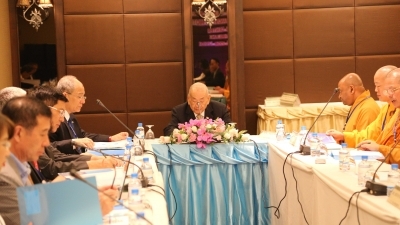 The 85th WFB Executive Council Meeting held at Chiangmai Grandview Hotel, Chiang Mai, Thailand from 31 August – 4 September B.E. 2558 (2015) and Study Trip to the Northern of Thailand. The Royal Thai Government has granted the Ministry of Culture, National Office of Buddhism, Crown Property Bureau of Thailand, Tourism Authority of Thailand, Government Savings Bank including Hotels, Bangkok Airways to support the Study Trip to the Northern Thailand so as to make the Honorable Guests and EXCO Members of the 85th EXCO Meeting realized the history of Buddhism, culture and tradition in Thailand. The President assigned Mr. Phallop Thaiarry (Secretary-General), Mrs. Sawanee Chuensumran (Hon. Deputy Secretary General), Ms. Pensri Roungpong (Hon. Asst. 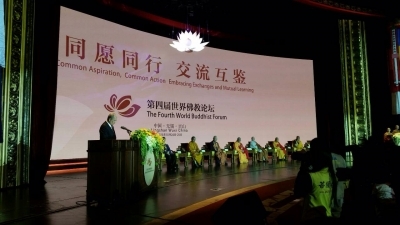 Treasurer) and Mrs. Kanchana Soonsawad (EXCO Member) to attend the Fourth World Buddhist Forum held from 24 to 25 October B.E. 2558 (2015) in Wuxi, Jiangsu Province, People’s Republic of China on the theme of ‘Common Vision, Common Action- Embracing Communication and Mutual Learning’. The Presidential Message was read by the Secretary-General.